Over the next week, I will be meeting with some of the most influential conservatives in the entire state of Idaho. I will post new articles when I can, but because my schedule is going to be absolutely packed this week it will be tough to get something new posted every day. -I am the most conservative candidate in this race by a wide margin. -I have the best message of any of the candidates, and it isn’t even close. -My team is extremely effective at getting my message to the voters. -If we can get that message out to every voter in this district the way that we need to, we will win this election. -The major thing that could keep us from winning the election is a lack of resources. Because we have the best message, we don’t have to raise more money than the other guys. We have been bringing in lots and lots of small donations, but it takes a huge pile of those small donations to keep up with the enormous checks that the professional politicians in this race have been pulling in. They may not have as many donors as I do, but when wealthy individuals are writing $2700 checks to them it adds up fast. -I am openly calling for all of the RINOs (Republicans in name only) to be voted out. -I have made an unbreakable pledge to vote against any bill that contains even a single penny of funding for Planned Parenthood. -I want to abolish the income tax, the IRS and the Federal Reserve. -I want to repeal the major federal gun laws that are unconstitutionally restricting our 2nd Amendment rights. -I want to build the wall and do all that I can to stop illegal immigration. -I want to abolish the Department of Education and return control of education to the local level. -I would fight like mad to stop the reckless borrowing which has put us 20 trillion dollars in debt. -I would fight for a 100% repeal of Obamacare and to restore free market principles to our healthcare system. 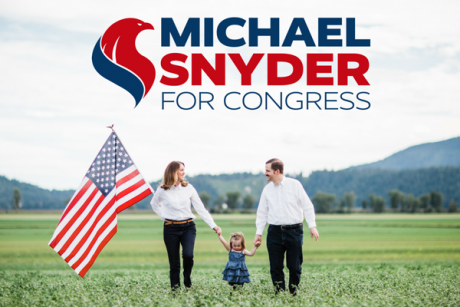 -I want to clean up the corruption in Washington, institute term limits, and make our Congress critters live by the same rules that apply to everyone else. -And I am unashamed to say that I am running on a pro-liberty platform and that I want to restore the constitutional Republic that our forefathers fought and died to establish. Thanks to you all, we have the best looking brochures of anyone running for any public office in the entire state, our signs are starting to go up along the major roads, and our videos have already been viewed by thousands upon thousands of voters. We are beating the other candidates to the punch in just about every area that you can imagine, but without sufficient resources we will be greatly limited in what we are able to do moving forward. As I have said before, if every single one of my readers donated just $10 today, we could be done funding our campaign tomorrow. Every single dollar makes such an enormous difference, and if you were ever going to stand with us, now is the time. This September 30th deadline is a make or break moment for our campaign, and we really need to find a way to raise at least $25,000 over the next seven days. I believe that it is possible, and I am asking for your help. If a thousand of you stepped forward and donated just $25 to the campaign, we would be able to meet our goal. I would like to thank everyone that has joined the campaign so far. More volunteers, donors and social media warriors are stepping forward on a daily basis, and we would have never been able to come so far in such a short period of time without your help. Now this campaign is getting ready to go to the next stage, and so we need more of you to step forward and join the team. On my own, I could never do this, but if we stand united and work together we are going to absolutely shock the world.